An Essential Model For Radial Artery Puncture. Arterial Puncture Training Wrist features palpable arterial pulsation, realistic resistance of tissue and artery wall to injection needle. Natural flashback of artificial blood into the needle can be observed. Puncture skin, pad an artery tube are replaceable. No puncture trace remains on the injection site. One-touch, leak-free connections. Easy clean-up. This innovative simulator is designed to provide training in arterial puncture and practicing complete skills ranging from the needle insertion to catheter insertion. 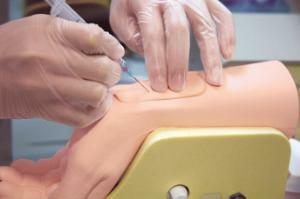 This simulator helps to cultivate the skills in this challenging procedure. Radial arterial puncture, Artery blood sampling; Radial line placement, and Catheter insertion and placement.